Day 1: Once at the border, we took the long-boat crossing over the Mekong from Huay Xai to Chiang Khong which took only a few minutes. Once on the Thai side, we had to queue only 15minutes to get our Thai visas then board the bus to Chiang Mai. We now had a huge modern coach with only 10 of us, so we could spread out a bit which was nice, and me and Mike spent most of the time swapping travel stories with an American lady called Muriel who had recently been to India so gave us some useful tips. In all took about 4 hours until we arrived in Chiang Mai. We took a tuk tuk to Good Will hostel which was set over the bridge from the centre, then headed out to check train times. With the mammoth bus journey still fresh in our minds, we really didn't want to take another night bus back to Bangkok. we initially took a wrong turning and found ourselves lost in the suburbs before we backtracked and eventually made it to the station. On arrival we were told that no beds or seats were now available on the day we wanted, so dejected we headed to a nearby bar for lunch. When we were leaving to pay though, we ended up in a heated argument with the owner after they over charged us for our food. They were clearly on the wrong but we still had to pay which left us feeling well angry. Not an altogether best start to being back in Thailand. Back at the hostel we booked our night bus for the following day for a bargain 400 baht (£8) each, had a rest, then ventured to the famous Chiang Mai Night Market. In took about 10minutes to walk to the markets which had loads of stalls with all the paraphernalia we'd been waiting to buy for ages - more magic pants, knock off designer bags and watches. It seemed to go on forever. I managed to get some pink silk trousers I'd been looking for since Vietnam which was great (though I had seen then in Luang Prabang Noght Market and refused to get them, but got confused with the Kip to Pound to Baht conversions, I ended up paying more :( oh well). We ate at a restaurant just off the main road which had heaps of lush Thai dishes. I really struggled to get through mine because of the chest pain I'd been having was getting worse. Back home we watched 51st State with Samuel L. Jackson which was awful, then Mike went sleep. I couldn't sleep much at all as every time I'd lay down, the burning sensation would start up again in my chest :( Had a look online and realised I'd probably got Oesophagitis from the doxycycline I'd been taking for malaria and all the lush spicy food we'd been having in Asia. Realised then we'd probably need to get to a doctors which wouldn't be until Bangkok in two days so I'd have to grin and bare it til then. Day 2: Today we ventured further into the city. Chiang Mai's main temples and centre lie over the river and are surrounded by a huge wall and moat so we were looking forward to an explore. Chiang Mai is a lot cooler than Bangkok so got to where my new magic pants today :) First we stopped off at a tex mex restaurant where Mike had a mammoth sized burger and I had some onion rings and mashed potato as I thought I'd be able to manage that, but even after loads of Gaviscon I couldn't finish it. The centre was a lot more touristy than our hostel area, with little restaurants and clothes shops around, but none of the bars and clubs like Bangkok. We first went to Wat Chedi Luang which we'd heard was really nice. On the outside it was like any other Wat, but inside was gorgeous. From the ceiling there hung hundreds of gold and multicoloured banners with pictures of the animals of the Chinese/ Thai zodiac which looked amazing. Either side of the central walkway were seats for monks, with one monk giving blessings to people from one side. 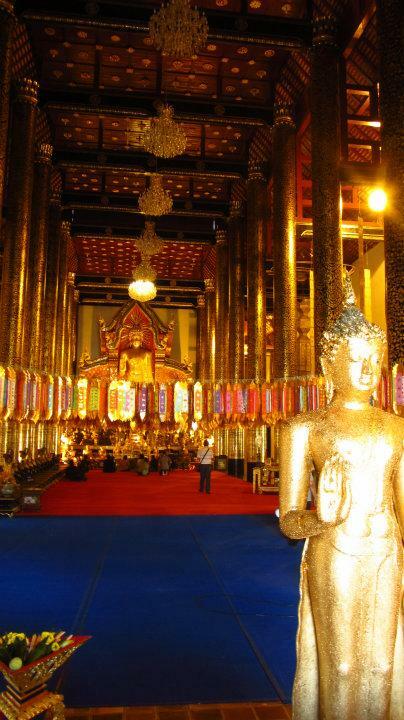 At the front there were many gold Buddha statues. We both just sat on the floor under the gold tapes in front of Buddha for a while. It was really peaceful and lovely. My favourite Wat so far I think. We headed out and around the temple grounds. As the temple is part of a monastery, they also had some novice monks available to chat to. We found out that a lot of men become monks when they are young, and when they graduate at about 16, they then can decide if they want to take their vows to become a monk. A lot of people decide to become a novice as it means they can learn English and other subjects as in a normal school, but mostly they learn about Buddha's teachings, meditation and how to live by Buddha's teachings in the modern day. They also, we found out, have tons of free time (probably because they get up before sunrise) to watch movies, use the Internet, and play football just like normal teenagers. Was really interesting as I thought that being a Buddhist monk would be like Catholic monks where they live a life devoted to God with little contact with the outside world. Was really nice talking to the monks after seeing so many temples with statues of Buddha and monks everywhere for months. After another walk around the temple, we visited a slightly older temple next door, constructed from wood but with the same gold banners hanging from the ceiling, and another temple 'Wat U Mong' on the way back to our hostel. We sat in a cafe for a while just watching the tuk tuks and bikes whizzing past us near the main gate into the walled city. Was a nice end to the day. Short stop back at the hostel, then back out for dinner. We'd noticed that on the riverside there were restaurants with Chinese paper lanterns in the trees, so we headed there for dinner. The first restaurant we saw was crazy expensive, and the next two had huge queues so we settled on one that was behind a handicraft shop. Glad we did though as it was beautiful outside, with boats going past on the river and the lanterns in the trees. I ordered a rice soup but eating was getting worse. Mike had a chicken massaman curry which he said was amazing - huge pieces of boneless chicken, thick spicy curry with cinnamon sticks and spices all thrown in. Lush. Day 3: After a ridiculously bad nights sleep because of the reflux, we checked out late so I could sleep, while Mike headed out to an Internet cafe to fill out his Indian visa application. We had a couple of hours left to kill before our bus so we wandered around the Sunday markets and grabbed some food before heading back and calling my parents. We were picked up and taken by tuk tuk to a random petrol station well out of town and boarded the packed bus. We managed to get two aisle seats next to each other and enjoyed The Scorpion's concert DVD thoroughly which was just as well because it was incredibly loud. As with most of our night bus journeys, we both didn't sleep great, but had to keep reminding ourselves that this was our last ever night bus journey :) Onwards to Bangkok!